Welcome to Buffalo Road Imports. 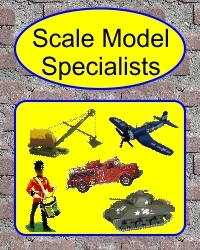 We have been importing and distributing scale models and books since 1978. We offer the largest selection and largest stock of construction equipment models in the world. 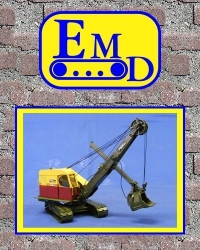 Along with our selection of construction equipment models, we also offer cars, trucks, busses, airplanes, soldiers and many more models ranging from toys to museum quality replicas. We offer a large selection of primarily construction and mining equipment models produced under our manufacturing name of Engineering Model Developments (EMD). Offering everything from handbuilt resin and white metal models to super detailed brass models and highly detailed large production diecast models. 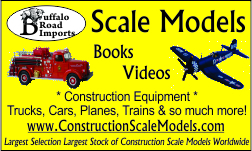 We are proud to now offer a line of books for enthusiasts of trucks and heavy equipment. 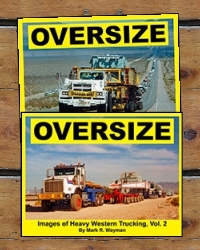 Our first title "OVERSIZE - Images of Heavy Western Trucking, Vol. 1" was well received with everyone asking "When is volume 2 going to be available?" Fortunately Mark Wayman has been working tirelessly on the book and will be available Summer of 2011. We also have several other prospective books being researched. Visit the Buffalo Road Imports family of web sites. Copyright © 2010 Shawn Lewis and Buffalo Road Imports or used by permission from the copyright owner. All Rights Reserved. No part of this website may be distributed, reproduced, republished, or stored in a retrieval system, or retransmitted in any form or by any means--electronic, mechanical, photocopying, recording or otherwise--without the written permission from Buffalo Road Imports.